We also lose trust from our users if we write government ‘buzzwords’ and jargon. Often, these words are too general and vague and can lead to misinterpretation or empty, meaningless text. 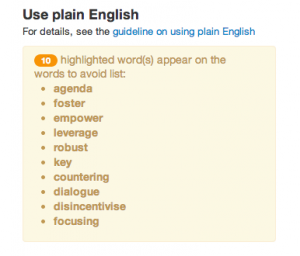 To help publishers avoid these words, we've built a new feature in Whitehall Publisher that highlights the words to avoid in the text as you type. For some browsers where this isn't technically possible (eg, Internet Explorer 8), we display a list of the words to avoid that you've used. Both methods help you check that your content sticks to the style guide, helping users understand and trust content on GOV.UK. This is a potentially really useful feature, but could you tell me for which browsers this is 'technically possible'? It doesn't appear to work in Chrome.